The PRISMA spacecraft will lift off atop a Vega rocket at 9:50 p.m. EDT (0150 GMT on March 22). 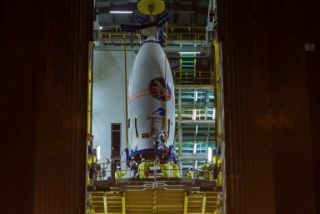 Encapsulated in its protective payload fairing, Italy’s PRISMA satellite is positioned atop its Vega rocket. The PRISMA spacecraft is scheduled to launch atop an Arianespace Vega rocket from Kourou, French Guiana, at 9:50 p.m. EDT (0150 GMT on March 22). PRISMA, whose name is short for "Precursore Iperspettrale della Missione Applicativa," will be operated by Italy's national space agency. The satellite will set up shop in low-Earth orbit and make observations that aid resource management, environmental monitoring and other fields, Arianespace representatives have said.